The Sports Turf Managers Association (STMA) recently announced the winners of their 2011 “Field of the Year” award, and the state of Maryland has two winners: University of Maryland’s Ludwig Field and the Maryland SoccerPlex in Germantown! Both facilities won in the soccer category, Ludwig Field for “College and University” and the SoccerPlex for “Schools and Parks”. The awards bring national recognition to outstanding fields in our area. While the fields are heralded around the Mid-Atlantic, their praises are now being sung around the country. Fifteen fields are selected each year, with honors going to the top baseball, football, soccer, softball and “sporting grounds” facilities. Under those categories, there are three sub-categories for “Schools and Parks”, “Professional” and “College and University”. STMA appointed six judges to independently grade all the entries based on playability and appearance of the playing surfaces, innovative solutions employed, effective use of budget, and the development and implementation of a comprehensive, sound agronomic program. The award is then given to the highest score in each category. 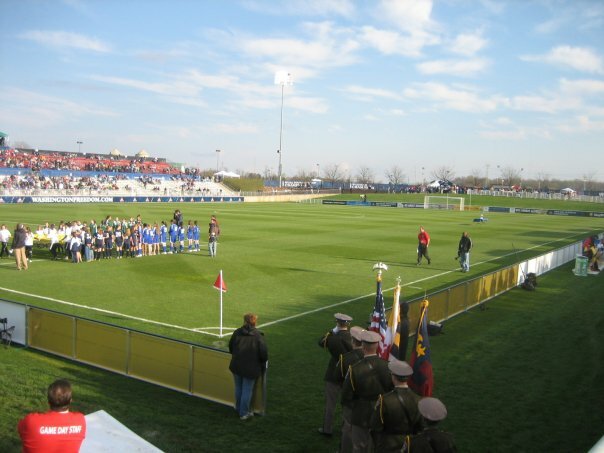 The Maryland SoccerPlex features 22 full-sized outdoor fields and a lighted Championship Stadium that seats 4,000 spectators. On average, the SoccerPlex hosts over 200 sporting events a year, including youth leagues, tournaments, professional games and NCAA matches, like this year’s ACC/Big East Challenge that featured Maryland, West Virginia, Virginia and St. John’s. It’s also the home of the DC United Women of the W-League. Ludwig Field is the home of the University of Maryland’s soccer programs. In addition to the soccer teams, Ludwig is also the home of the women’s lacrosse team. The complex has 4,500 permanent seats; with the addition of temporary stands, the stadium can seat about 7,000 people. This past fall, the men’s soccer team drew the largest crowd ever to the stadium when 7,957 fans showed up to watch the Terps victory over Duke. In addition to collegiate matches, Ludwig has also hosted the US Women’s National Team and DC United. Ludwig Field is managed by Jeremy Menna and the SoccerPlex fields are managed by Jerad Minnick. Both men will be presented with the award on January 13 at the Annual STMA Awards Banquet in Long Beach, CA.